We love Vietnamese food. Or as Mr. C says, Vietmanese food. 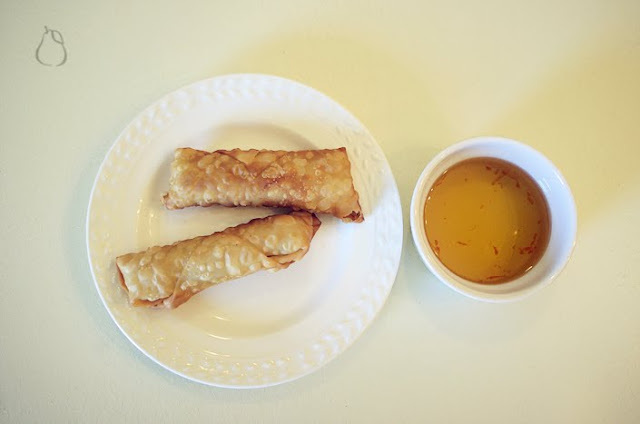 So when I spotted a recipe for Vietnamese Egg Rolls and Nuoc Cham (dipping sauce), I had to try it out. Thanks to Lynn for the recipes. They were absolutely delightful. And I am so proud of myself, even though I had to use wrappers that were a little on the thick side which is the reason I think they are a little bumpier than the traditional ones. The whole family was impressed with them as well, which is always a bonus when they ALL agree on the goodness of dinner. That is a rare occurrence indeed. I also made Bun Thit Nuong Cha Gio (noodles, grilled pork, egg rolls, and Nuoc Cham), but the pork was so heavenly, in fact the kids dubbed it "Heaven", that we ate it all, every last bit, before I could get a picture for you. It's basically a bowl with the thin vermicelli rice noodles, some greens such as green leaf lettuce, cilantro, mint, basil and cucumber...all topped with bits of egg roll and some outstanding grilled pork marinated in a delightful homemade sauce... all smothered in Nuoc Cham (dipping sauce). Mmmmm, I'm hungry again. I also made an outstanding mess in the kitchen, but I'll do it again in a heartbeat! Yes, I'd like to make a reservation for two, please. We shall tip you handsomely. :) What got you started on "Vietmanese" food, Lou? It looks and sounds positively scrumptious! oh yeah...it is divine, isn't it? We have made them with the more authentic rice paper wraps, and while they were more authentic...they were MUCH more difficult to keep from tearing and that just ruins it all. So go with the other... we also make lettuce wraps. Basically the same stuff, noodles, the grilled pork, shredded carrot, green onion, and lots and lots of Nuoc Cham. All wrapped up in large lettuce leaves. Our kids eat it FOREVER! 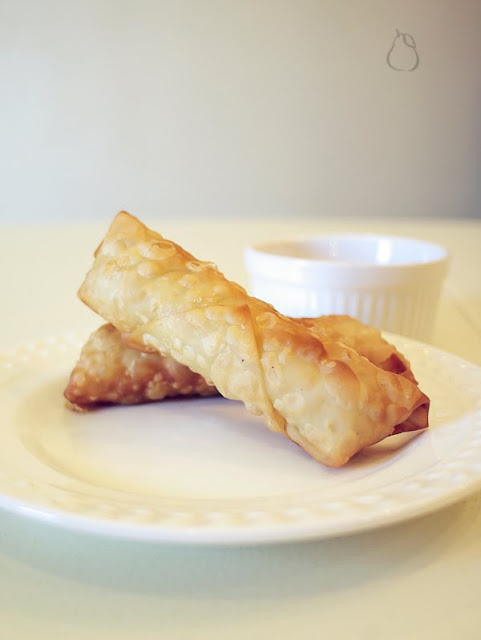 Have you made spring rolls with peanut sauce? We are trying that next. MMmmm, I think I need to order out tonight. oh! And don't forget the chopped peanuts. HEaven! Vietnamese is our favorite! I order spring roll wraps (rice paper) online. What I wouldn't give for our fave NYC restaurant right now (which just happens to be Vietnamese). My favorite is pork spring rolls dipped in peanut sauce but Q likes the lettuce wraps with Nuac Cham minus the mint. I say he's crazy. The mint is the best part. You are courageous for trying to cook Vietnamese at home. Yum Yum Yum! Great!I can't wait to come to your house for lunch. When should I be there? You do owe me lunch since I fed you today, right?